Stage 16: Carcassonne to Bagnères-de-Luchon. 218km. We’re back in the mountains today, with a 218km stage taking us across the plains of Aude and Ariège and into the Pyrenees, with a brief incursion into Spain the only time this Tour breaches France’s borders. A stage of two halves, we get a 120km peloton parade to start the day and then all of a sudden we’re in the mountains. Grimpeurs will be pleased with the triple of Col de Portet-d’Aspet, Col de Mentée and Col de Portillon. 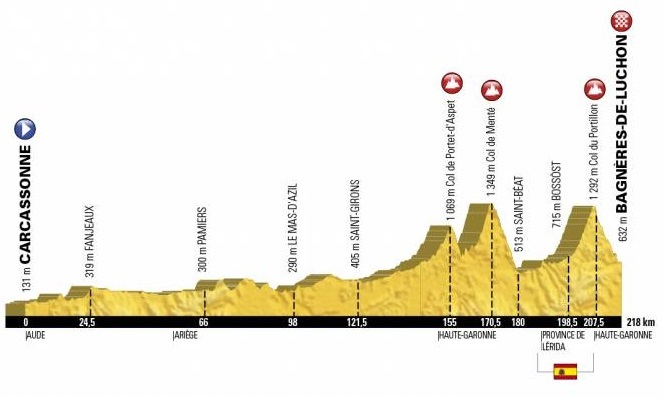 The rest of us will be glad that we tackle the final climb from its gentler side, and have an 11km descent into Bagnères-de-Luchon to end the day. This entry was posted in Tour Blog. Bookmark the permalink.